The GTS Elite kayak fishing seat looks like it belongs in a high-end sports car rather than a kayak with its deep molded center panels and the contrasting black molded foam perimeter padding . 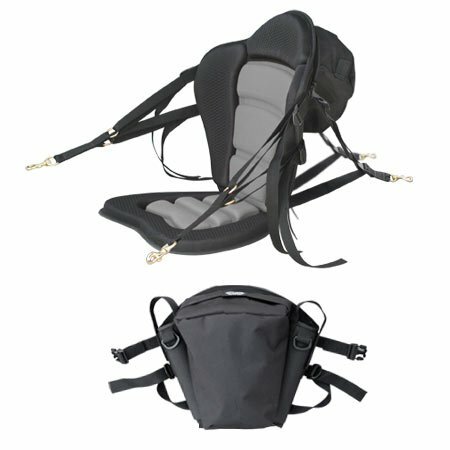 It has a new widened rear attachment straps for an even more solid positioning which helps prevent seat slippage. On either side of the kayak fishing seat the paddler has the option of micro adjusting their forward lean from four ''easy release'' thumb action tension locks. There are two lower tension lock adjusters for the lumbar area and two upper tension locks for adjustment of the forward lean. Overkill'' Perhaps, but tuning your kayak seat to custom fit your back makes a huge difference in the enjoyment of your paddling especially when spending long hours kayak fishing. The ergonomically sculpted 18'' tall back portion of the fishing seat offers maximum high back support encouraging a long day of fishing without having to worry about ample back support. The GTS Elite kayak fishing seat comes with a generous detachable zipper pack that has two solid plastic molded fishing rod holders incorporated into it. These molded rod holders have built-in fishing rod securing straps that easily wrap around your pole and Velcro down providing painless access while giving the paddler piece of mind in knowing the rod is safe. However, it''s always a good idea to back this up with on of our fishing rod leashes to ensure our pole stays with you. High performance thermoformed kayak seat. Marine grade solid brass connecting snaps.